Home /Astrology/Saturn in Libra: Will You Find Love? Saturn is the Father Time planet of the zodiac. Wherever this heavenly body moves, areas of our lives are marked with the ultimate limitations about what we are fated for. Saturn is known as the last luminary – it is the planet deepest in our solar system that is still visible from Earth. It was long ago considered the harbinger of our final destiny. With the discovery of other planets in the zodiac beyond what we can see, a more sophisticated view of Saturn slowly formed that softened this scary ringed planet. Saturn’s limitations are now often seen as the best method of self-discipline that any of us could hope for. Where Saturn goes, we can call what we find to be “limiting” but we can also choose to see it as receiving that which we have earned. When you are looking for love, Saturn delivers destiny. If you have concentrated on beautifying your outside with no attention to making your personality and other “inside” parts of you more pleasant, expect a good-looking oaf to sweep you off your feet. And so it goes, each sign of the zodiac gets exactly what they have earned in different areas of their lives when the ringed planet changes signs. If you are in a partnership pursuit, Saturn is about to begin a slow journey through the zodiac sign of Libra. This is the zodiac sign that rules partnerships. When you get what you have earned regarding one-on-one relationships, it is not necessarily love. Libra activity in the zodiac could indicate partnerships that are not of the soulmate variety. Saturn moves into Libra on October 29 and will be there until October 5, 2012. And to keep things interesting and unpredictable, Saturn makes a brief retrograde visit into Virgo from April thru July, 2010. Read for your sign below to see where partnership limitations will be most apparent in your life well into the beginning of the next decade. There is a karmic ring to the love bells that are making partnership noise for the Ram. Saturn’s visit to Libra makes a relationship the center of your life. Problems arise if you are delusional as to this person’s affections for you. The Aries habit of acting first and thinking later slows soulmate development. Partnering up will occur if it has long been on your “to-do” list. Saturn in Libra sees many of your long-term goals come into sharp focus, and things you have dreamed of accomplishing once in your life will become almost commonplace during the coming three years. The dilemma that you are facing here, though, is making sure that the man in your life is not just filling a role that any other guy could step into. Your creative inspiration could involve a partnership that bears wonderful fruit. A love entanglement while Saturn is in Libra is a relationship that deeply defines who you are and what you have to offer the world. The deep enmeshment in the life of another person, though, could have some lousy consequences if either of you begins to feel like a muse with no independence. Love and happiness arrive in your new home. Yes, Saturn in Libra gives you plenty of activity and most of it involves relocation of your physical self and renovation of your romantic energy. The blossoming of bliss takes place when you are in new surroundings and have new people in your life. The negativity of the old is washed away and Saturn in Libra brings about relationships that appreciate you for who you are. Your chances for love and success are all quite local when Saturn visits Libra. A good old friend could introduce you to the predestined soulmate of your lifetime. Everything casual will be serious, but don’t buy a bus ticket to leave town, because the familiar path leads to new and exciting times. There may be a bit of boredom overshadowing Saturn’s visit to Libra. A search for a deeper commitment could cause you to abandon a casual relationship and embrace some other form of love. Saturn in Libra brings you closer to a peaceful life of expressing your truest beliefs and “walking the walk,” but it could be a lonely walk with just you and your credibility. Are you willing to give up so much to gain simple insight? 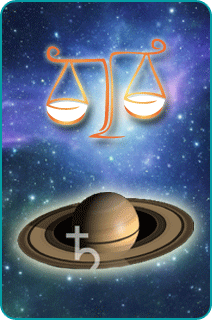 Saturn in your sign delivers what you have earned. So, what are you actually due? Have you given to the community? Have you pushed your creative gifts to a level that they contributed to experiences of substance for others? Have you been a giver rather than a taker? Prepare for three years of getting your due and your just desserts. You can probably describe now just how sweet they will be, if you are honest with yourself. Saturn visiting Libra will allow you to spend a few years getting a taste of the thing you have been chasing. While not the super success that characterizes your deepest dreams, you will be getting to know the reality of what was once just an illusion. This will keep you motivated to maintain your eyes on the prize. Love will find you, but could be in a form that prohibits commitment at the present. Expect more waiting for the miracle. Your optimism about the future will attract quite a following. If you ever wanted to get together with a group of like-minded people, joining a club with a mission is favored by Saturn’s visit to Libra. If you are intent on meeting a mate, the new socializing will give you some opportunities. Do not marry the first man that speaks to you but do not give up so fast on a lover if he is not the greatest date of your life after only one night out. The chance to get ahead in business or other career paths pushes love to the side. Saturn visiting Libra is great for Capricorn women who already have a loving spouse or partner. He will share your dreams of success in your field. But if you are single, look to get where you are going to before you pursue the best sort of loving that the universe has to offer you. Saturn’s visit to Libra finds you more talkative than usual. This will be a great time of socializing and learning. Your natural curiosity about things will be on a constant fact-finding mission. If your interest is in men, you will explore the subject, but penetrating to an emotional depth could be problematic. Your vulnerabilities will be closer to the surface than ever before. Are you curious enough to find out why? Limiting yourself to what others want to provide could be a way to find out who loves you. While Saturn is in Libra you will find so many ways to make sure you are loved. The need for certainty has never been too strong with you, but the next few years will see you overcompensating in this regard. A love interest becomes more attractive as he becomes more definite about what the two of you together really means.